Intarsia knitting is a knitting technique where you insert a picture or motif into your knitting using one or more colours. Intarsia knitting is a technique primarily for flat knitting. It should not be confused with its cousin, fair isle, which can be worked in the round or flat. Soon, we will feature Fair isle in another post. 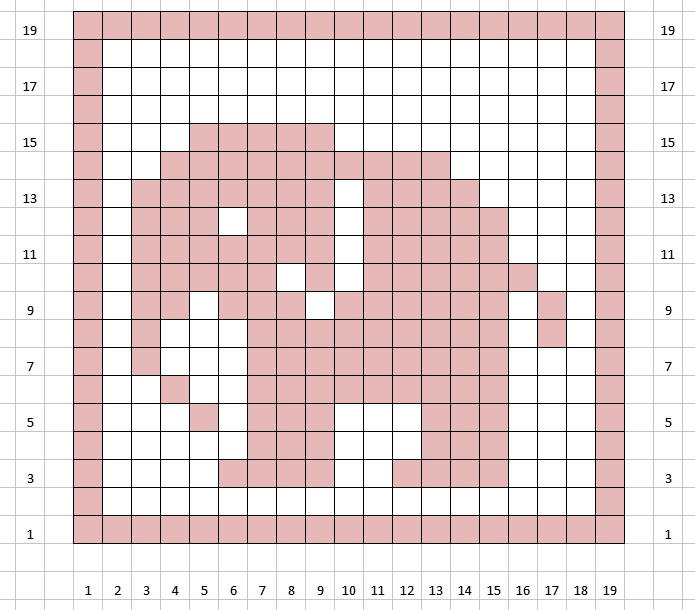 The chart above is an easy one that uses two colours. The odd numbered rows are the right side rows: read and knit them from right to left. The even numbered rows are the wrong side rows: read and knit them from left to right. To knit the motif above: find two balls of scrap yarn. One is the main colour (the background of the work) and one is the contrast colour that you will use to knit the bunny. Divide the main colour into two balls. From one of the balls cut two lengths of yarn about a yd.(m.) each. For the contrast colour you will need to cut one length of about 3 yd. (m) and three lengths of about a yd.(m.) each. Have a look at Ruth Herring’s video below for the general technique explanation. With the main colour cast on 31 stitches and knit 6 rows of stocking stitch, ending with a purl row. These rows are rows 1-6 of the chart above. Start row 7 by knitting 12 stitches of the main colour. Now use one of the lengths of contrast yarn and knit the 5 stitches of the bunny’s back leg. When you start each new length leave a 4 in. (10 cm) tail of yarn hanging down to be incorporated and then finished later. Next, using a length of the main colour, knit the stitches between the bunny’s legs. Then use a second contrast length of yarn for the bunny’s front leg. Finally use the other ball of the main colour to knit the rest of the main colour background. Row 7 is complete. Now turn the work and knit row 8. When you come to the first contrast colour stitch to be knit, insert your needle into the stitch. Carry the strand and the tail of the main colour over the contrast strand you are about to use, giving all the loose stitches a small tug to bring them to tension before you knit the stitch. Continue to the end of the contrast section and repeat the yarn switch every time you change yarns. If you look at the right side, the work will be smooth and there will be no holes. Well done! On to row 9: knit the next row of the chart. The tails were dealt with on the previous row so you no longer have to work with them. Just bring the old yarn over top of the new yarn each time you do a yarn change. Give the stitches a tug as you do the change so the tension of the whole work is as even as possible. The eye of the bunny is only two stitches in from the left edge. As it is a single stitch and it’s so close, you can “cheat” and knit it with the background strand closest to it. When you get to row 22 it’s all smooth sailing. 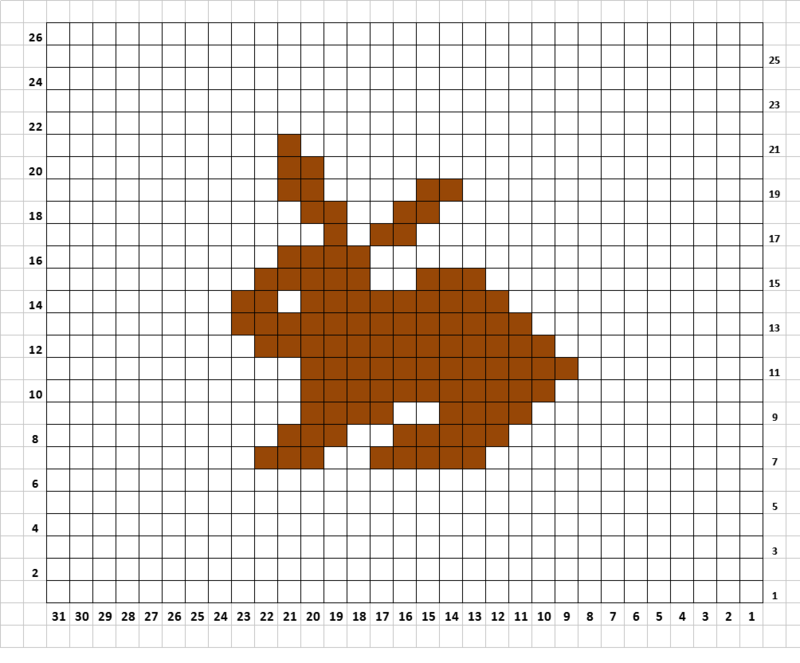 The bunny chart is done and you can finish off by knitting the remaining rows using a single ball of the main colour and cast off after the final row. Finally darn all the loose ends in neatly on the back side of the work. Now, ready for a challenge? This is my favourite intarsia sweater. Although it was published originally in 1986, the design is fresh and can be easily worn today. You can purchase the pattern for this sweater here: The Cat Lover’s Sweater for adults and kids. The designer was Barbara Service-Hillard. Don’t use bobbins that are marketed for intarsia knitting. They get tangled up and you can quickly become frustrated. Use strands about 2 yards (m.) long. You can pull them out easily to separate them. Don’t get too fussed about the strand length either. If you cut them too sort you can always cut and add another one. If the lengths on the back side become annoying, stop and darn in the ends created so far. This will reduce the tangle on the back of the work. Check for holes as you go. It’s possible to neaten them up when you are finished but you are better to check along the way. Ruth Herring does a great demo of intarsia knitting with tips on avoiding holes and developing good tension that will give your knitting a very smooth look.